The title of this episode could refer to the new CEO of Hope-Zion, Thomas Leferin (Arrow’s Joe Dinicol), who has come to town to observe the hospital. Dawn, who is sporting bunny ears and bunny scrubs because of a lost bet to Dana, calls a meeting to all Hope-Zion staff to let people know of the new CEO arriving and that everyone should be on their best behaviour. At this meeting, Dawn also introduces the newest intern, Dr. Billy Scott (Greg Calderone), who happens to be an old medical school friend of Dev and Cassie. Billy is an arrogant SOB and Dev definitely can’t stand the guy which of course Zach tells him to show him around. Their case is a frozen John Doe who has arrived in the ER. John Doe was found in a walk-in freezer. Dev, Cassie, Zach and Billy are working on warming John Doe up. When there is a cardiac event, Zach calls in Dawn. While Zach is away, the John Doe is slowly warming up but still shows no vitals. Billy calls a time of death but Dev wants to wait for Zach to come back. Dawn arrives with Thomas to hear Billy proclaim a time of death while Dev is still working on saving John Doe’s life. Dawn continues to work on John Doe and eventually brings him back to life. Dawn defends and praises the actions of her doctors to Thomas who wonders if her doctors like to freely proclaim time of deaths. We learn the John Doe is Chad a York University student who drank too much and must have wandered into a freezer. We also learn of Dev’s resentment towards Billy and that he cheated off him during a med school exam and was and still in unapologetic about it. Charlie’s patient is Todd, a War of 1812 re-enactor who has come in to Hope-Zion because of a broken arm and abdominal pain after falling off his horse. At first Alex was assigned to the case but she passes Todd off to Maggie to deal with another medical case. While in surgery, Maggie pretty much lets it slip that Alex didn’t want to be on the same case as Charlie. Nothing seems to go wrong with Todd’s surgery but Charlie sees his spirit in his War of 1812 character of Icarus Baltimore. Charlie tries to talk to him as Todd but he only responds as Icarus. Maggie tells Charlie about how Icarus died in the War of 1812 and how much Todd looks like him. When Charlie meets Todd’s spirit again still in character, he notices he is limping. Finally, Charlie manages to get Todd back who tells him of a childhood injury due to a tuk tuk accident. Todd blames his leg injury for being anti-social and how he joined the re-enactment society to help. Maggie and Charlie take a closer look at his injured leg and see that something is wrong and fix it. While Todd recovers, a friend of his from his re-enactment society comes for a visit and the two end up playing a game of Risk. Charlie and Maggie note how glad that Todd has found someone he has connected with. Maggie asks if Charlie has plans later and he says that he does. We see Charlie and Zach at a bar over drinks watching a boxing match. Earlier in the episode, Dawn asks Zach to ask Charlie out for a guy’s night out. Alex sees Manny on his day off with a field kit and wonders what he is up to. Manny confesses that he is going to treat Mia, a 16-year old runaway, who is part of his youth group. Mia texted Manny to say she is in trouble and needs his help. 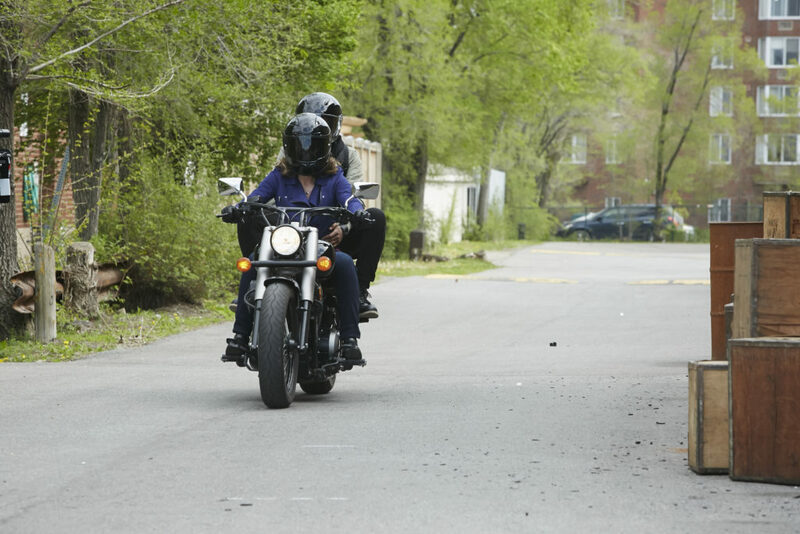 So the two hop on Alex’s newly acquired bike (don’t worry she only rides it once a week) to an abandoned warehouse where they mind Mia in the basement with a stab wound. Alex has to bring Mia to Hope-Zion but she worries this means her mom will be called. Alex tells Mia her mom won’t be called but she needs to go in. Once in Hope-Zion, Mia gets worse that requires surgery. Dawn sees Alex wandering the halls of Hope-Zion and is surprised to see her after Maggie told her she was taking a mental day off. Dawn confronts Alex for her lies especially when she was seen earlier that day. Also, Dawn is mad at Alex for making it look like she doesn’t know where her staff is in front of the CEO. When Alex asks for an OR for Mia, Dawn shuts her down and pulls her surgical privileges. Alex doesn’t agree with the decision but Dawn stands firm and tells her that she made her own rules and now she has to follow it. Alex does follow her rules and goes through the surgery and asks Manny to distract Dawn. Manny does so just before Dawn can show Thomas the OR by faking a panic attack. Eventually, Dawn sees through Manny’s performance and demands to know what is going on. Dawn then spies on Alex’s surgery from the gallery and she sees her save Mia’s life. Afterwards, Dawn is mad at Alex and did warns her that she would fire her for defying her. Dawn doesn’t because Alex did save Mia’s life. Dawn also wonders what is going with Alex as she doesn’t seem herself. Alex is sorry that Dawn doesn’t think she is herself but assures her that she is fine. We later see Alex at the Hope-Zion parkade trying to take a selfie of her with her motorcycle. Manny comes along and takes the picture for her. Alex then asks why Manny left the seminary who tells her that he left because he couldn’t save his brother. There is talk about taking new journeys together and Manny asks if he can take it with Alex. The two then ride out of the parkade on Alex’s motorcycle. I am not on board with Alex and Manny and hope the show doesn’t go there. It is clear that Manny likes Alex but we only have a finite amount of episode left for the show to bring her and Charlie together. As an Erica fan from Smallville days, I usually rely on your recaps to keep up with Saving Hope (I have tried, but medical shows are just not my thing, I guess). Because of the whole Clois vs. Clana shipping war, which till this day leaves a bad taste in my mouth, I have been hoping to see Erica on a show where we can avoid this. I know with Joel dead, there isn’t a love triangle anymore on SH. And honestly speaking, I am perfectly fine if there is no “happily ever after” in the romance department, as long as Erica’s character gets a great send-off. My point for all these chatter is to ask you, that could the reason Alex and Charlie has broken up is because the PTB intend to show Alex as a single woman at the end of the series? Based on what Alex has gone through – as you have watched every episode of SH – do you think it will make sense for Alex to be alone at the end of it all? Thanks for your questions. First off, I loved or still love Clois and did hate Clana but I never got into any heated arguments with anyone over it. I do see your point in leaving a bad taste in your mouth. I never saw the point in routing for Alex and Joel because I knew that Daniel Gillies could not sustain being a major character on two shows filming in two different countries at the same time. Also, the show is built on the Alex and Charlie love story. So to your question, did the PTB want to break up Alex and Charlie so she ends the show as a single woman? I don’t think so, I just think this is a stereotypical TV trope of keeping the central couple apart until the series finale. That being said, with another show like Downton Abbey, before it ended, I was thinking that perhaps Edith’s happy ending was not her getting married but actually being a successful magazine publisher and raising her daughter as a single mother. I didn’t think her marrying Bertie was necessary but I did love her happy ending. Back to Saving Hope, it is possible (and this is pure speculation) but it might be possible that Alex dies in the series finale and her spirit and Charlie have this lovely moment before she goes to the other side. Charlie is left raising Luke on his own as a single father. The reason why I am thinking this is because all of the cast has been saying one of their favourite scenes of the show is between Erica and Michael in the series finale because it so emotional. You have brought up an interesting point, and in a way, I did wonder of a similar ending for Saving Hope. Again, I may be wrong here since I don’ t watch the show, but I did see the images posted by the cast on the last day of shooting (or it could be the finale episode shooting, and not necessarily the last day). My point is, Erica looked heavily pregnant, at least from the chest below. Now they can shoot scenes showing Alex’s face, but I do believe it will make more sense to write in Erica’s second pregnancy than not. And one shot had Erica looking pregnant and sad, in a black dress. There is a behind-the-scenes image of Erica in the same dress with actors Ben and Huse, though Erica is smiling in that shot. Anyway, back to the shot where she is wearing black and looking sad, I wondered if it was Charlie who dies and Alex is left alone in the end. In fact, this was one of the reasons for my original question to you. Of course that still leaves behind the babby-daddy question, as you so correctly put in your recaps. Thanks for the recaps! I stopped watching Saving Hope last season because this show jumped the shark (though I still keep up with the recaps :-). They really should have ended Saving Hope after last season. They are just rehashing old plot lines – like you said in a previous recap, Alex + Manny is a repeat of Alex + Joel.